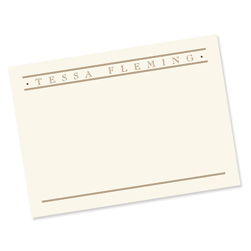 Description: For more stationery choices click Embossed Graphics to go to our sister site to order. A thoughtful gift for a business person or the casual note writer. Size 4.25" x 6.5". Paper: White or ivory. Ink Colors: slate, mocha, purple, navy, black, red, emerald, fuchsia, ocean, or sage.